16-20 Wrest Park – WW1 Rifle drill and WW1 weapons. Also our WW1 Nursing display. Help the busy nurse by winding bandages or learning how to bandage a patient. Learn about the minor horrors of war such as rats & lice and the diseases that they caused in our timed talks. Plus lots more, see images from the time with our amazing 3D Stereographs (very popular with the kids). EH. 21 Colchester Castle – Join us at the castle to learn about medieval armour & weapons & surgery through time. We’re supplying the medieval and WW1 elements. (Colchester Council). 30, 31 & 1 April – Colchester Castle – Come and try on some medieval armour and learn about medieval armour & weapons in our timed talks. 3-6 Dover Castle – We will be at Dover running our medieval toys, clothing and armour displays. EH. 25-26 Dover Castle – Join us for the castles annual, St Georges day event, meet the dragon and St George! We’ll be running our medieval criminal trials and surgery displays. Plus lots more. EH. 2-4 Brodsworth Hall, Yorkshire– Our first time at this lovely property. It’s Victorian month. Come and visit us and play some Victorian games. There’s also a musician and punch and judy man. EH. 24-25 – Wrest Park – Wrest at War event. This is an annual event about WW1 & WW2. Come and join us to learn about rationing and WW2 crime. EH. 26-31 – Bodiam Castle – Come and play some medieval toys or make your own toy for £2.50 from Bodiam Wood to take home with you. All proceeds go to Bodiam. NT. 14 – Penshurst Village Fete – Our first time at this village fete, taking place in the grounds of Penshurst Place. 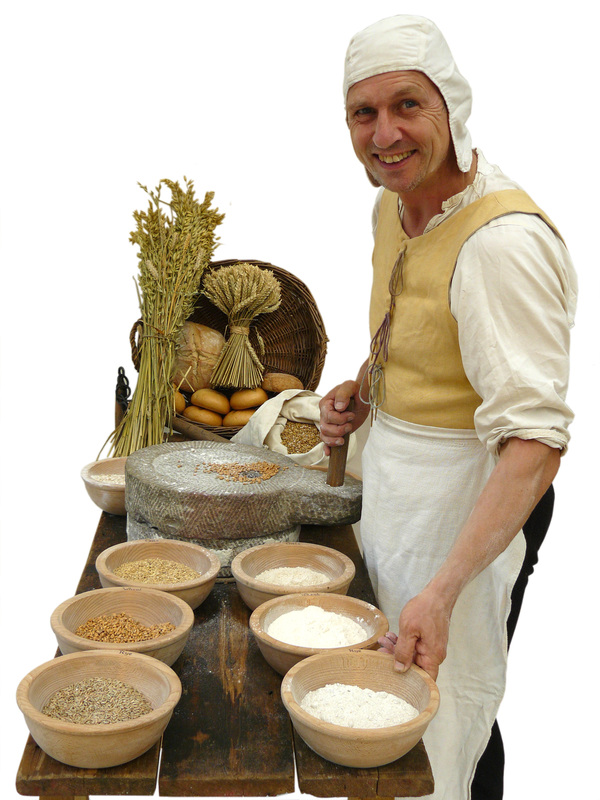 We will be running our medieval toys & games and milling displays. 12.00 to 5.00 PM. £2.00 entry, free for under 16s. 22-26 Bodiam Castle – Medieval week for schools. Would you like to visit Bodiam Castle, why not make your students visit even more special by visiting Happening History at the castle. All week we will be running displays on medieval life. Students can learn about clothing, food, marriage, try on armour, hold a weapon or learn about medieval surgery. Booking is essential so please contact the castle directly or we’d be happy to pass on your details. Displays for all Key stages. NT. June 29 -30 and July 1-3 Bodiam Castle – Medieval week for schools. Would you like to visit Bodiam Castle, why not make your students visit even more special by visiting Happening History at the castle. All week we will be running displays on medieval life. Students can learn about clothing, food, marriage, try on armour, hold a weapon or learn about medieval surgery. Booking is essential so please contact the castle directly or we’d be happy to pass on your details. Displays for All Key Stages. NT. 12 – Pullingshill Wood & Marlow Common – We are running our WW1 Tommy and nursing displays. Wel will be doing assault course, rifle drill. I’ll be running my ‘Treating Tommy’ talks. Our first event at this site and for the Woodland Trust. 3-4 – Goodrich Castle, Herefordshire – Another first for us. Wel will be running his medieval trials. Be put on trial for your crimes or be part of the jury and help decide their guilt or innocence! 7 – Chesterfield Museum – Learn about the history of the penny through time. Mint a medieval coin (small charge of 50p to cover costs) or print your dream cheque (for free) on our 1920s cheque writer. 10-4. Free entry. CHESTERFIELD COUNCIL. 13-14 – Stokesay Castle, Shropshire – The Sheriff (Or Shire-Reeve) will be holding trials throughout the day, learn about how you would have been tried or punished in medieval times but careful or you may end up in the stocks yourself! EH. 15-16 – Kenilworth Castle – We will be running our Medieval surgery and medieval clothing displays. Time talks on surgery throughout the day. 18-20 August, Carisbrooke Castle, IOW – Joust! Part of a much larger event with jousting, traders, re-enactors, jester and much more. The Sheriff (Or Shire-Reeve) will be holding trials throughout the day, learn about how you would have been tried or punished in medieval times but careful or you may end up in the stocks yourself! Mix up a medieval medicine or learn the gruesome tales of the surgeon. EH. 22-23 – Kenilworth Castle – Medieval toys & games & be put on trial for your medieval crimes. 25-27 August, Carisbrooke Castle, IOW – A 2nd week of Joust! Part of a much larger event with jousting, traders, re-enactors, jester and much more. The Sheriff (Or Shire-Reeve) will be holding trials throughout the day, learn about how you would have been tried or punished in medieval times but careful or you may end up in the stocks yourself! Mix up a medieval medicine or learn the gruesome tales of the surgeon. EH. 30-31 Audley End House & Gardens – Part of a larger WW2 event. Ivy will be on hand to explain the rationing system. Young visitors can measure out a weeks rations and mark them off in the ration book. Our ARP warden is also on hand to tell you about bombs, gas masks and the blackout. Learn how to put out a fire or try out our real Morrison bomb shelter! EH. 19 – Priory House, Dunstable – We will be running our 18th C trials at this new site for us. Come and be put on trial and learn about the bloody code, transportation, highwaymen and body snatchers! We are also running our Penny Through Time display. Mint a medieval penny or print your dream cheque. Learn about the history of the penny from it’s first appearance to the present day. 28 September to 2 October Bodiam Castle – Medieval week for schools. Would you like to visit Bodiam Castle, why not make your students visit even more special by visiting Happening History at the castle. All week we will be running displays on medieval life. Students can learn about clothing, food, marriage, try on armour, hold a weapon or learn about medieval surgery. Booking is essential so please contact the castle directly or we’d be happy to pass on your details. NT. Suitable for all Key Stages. 5-9 Bodiam Castle – Medieval week for schools. Would you like to visit Bodiam Castle, why not make your students visit even more special by visiting Happening History at the castle. All week we will be running displays on medieval life. Students can learn about clothing, food, marriage, try on armour, hold a weapon or learn about medieval surgery. Booking is essential so please contact the castle directly or we’d be happy to pass on your details. NT. Suitable for all key stages. 12-16 Bodiam Castle – Medieval week for schools. Would you like to visit Bodiam Castle, why not make your students visit even more special by visiting Happening History at the castle. All week we will be running displays on medieval life. Students can learn about clothing, food, marriage, try on armour, hold a weapon or learn about medieval surgery. Booking is essential so please contact the castle directly or we’d be happy to pass on your details. NT. Suitable for all key stages. 24 – Braintree Museum – Join us to learn about the arming of the knight and medieval weapons as part of this special Medieval and Magna Carta event.